As water damage restoration experts in Sonoma, we know how much damage leaking appliances can cause. Whether you have installed hardwood floors, ceramic tiles, luxury vinyl tiles or carpets, flooring is one of the most expensive things to replace when it has been irreparably damaged by water. When you hear the word ‘water damage’, many people think of flood damage or even a large, burst pipe with water rushing out from below the sink. The truth is that a lot of water damage occurs much more subtly. Leaking water supply lines to your washing machine, a leaking fridge, cracked tiles in the shower, and other less conspicuous elements and appliances can slowly leak water over a period of time, causing your flooring to rot and warp. Some of the most potentially damaging maintenance items in a home are washing machine and dishwasher hoses. There are two basic types of appliance hoses namely rubber, and stainless steel braided hoses. Rubber hoses are made of layers of rubber and cloth, and they can deteriorate more rapidly than stainless steel hoses. Stainless steel hoses are made of extremely flexible rubber and are reinforced with a flexible mesh of stainless steel wire. They have a higher success rate than their rubber counterparts as they can be installed in tight spaces without kinking or creasing, which is often the cause of a burst hose. If a hose does burst, it can not only damage the motors of appliances, but the flooring of the surrounding area may also need to be refinished or replaced. 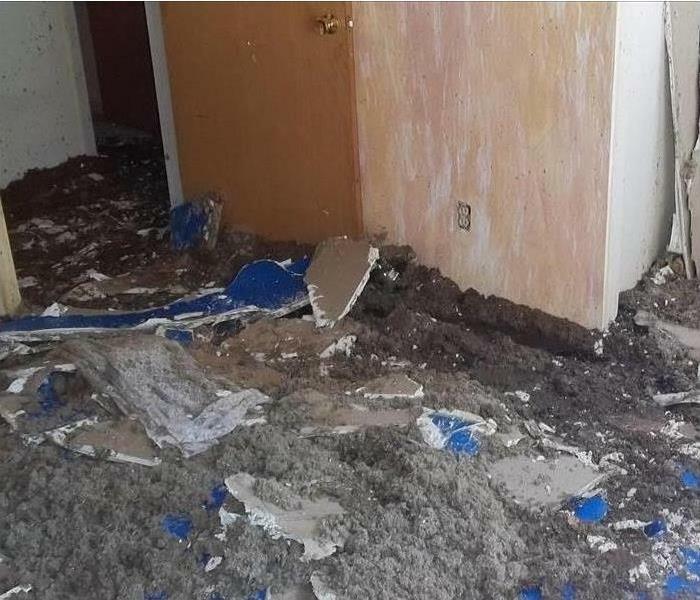 As the water level rises, baseboards and drywall can become waterlogged, causing potential for mold growth which can be unhealthy for you and bad for your budget. Did you know that a five-base inch washing machine hose can produce 37 to 75 liters of water per minute? That is up to 64.000 liters in 24 hours, which is enough to fill almost three swimming pools. Consider replacing them every three to five years. SERVPRO of Sonoma County N.E. offers home water damage restoration services and repair services. Our 24-hour emergency response team is faster to respond to any size disaster, and we used advanced water inspection, extraction, and drying equipment. Contact us for more information today. Go ahead, sweep up that ash, soot, plastic, metal, toxins...wait? Do you have a big enough sweeper, or a mask, or enough time to take care of this?! 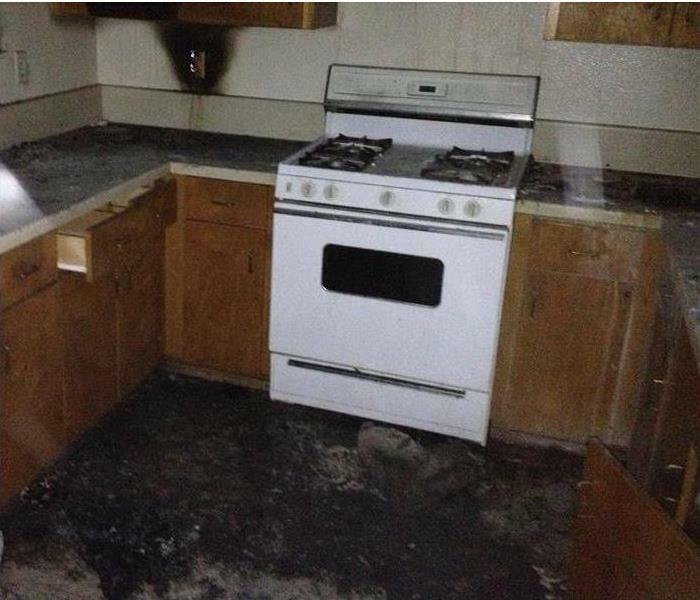 With fire damage, there may be more than just one loss from the elements. The home could be at risk for water damage from fighting the fire, or mold damage from any water that hadn't yet dried! Suffering from one loss is enough, you don't need to suffer from two or three. This Larkfield-Wikiup damage happened just a few months ago, and it was a lot of work for our technicians. If it's a lot of work for us, we imagine it's even more work for you. What is fire damage remediation? In relation to work needed in Larkfield-Wikiup, fire damage remediation sound fancy, but it simply means fire damage repair/restoration. We strive to put a damaged home back together how it was before the fire. Basically, we want all the signs to be gone that the fire ever existed! We can't erase your memory, but we sure try to erase the everyday visual of what your home had to go through. Who can work on fire damaged homes? We always recommend that a crew supervised by a licensed technician-one that has IICRC credentials-be in charge of any restoration project you have. Big or small, the wrong technician will make the fire damage issues bigger than they need to be. Don't go that extra mile, just go to SERVPRO! 24 hours a day, 7 days a week! A neighborhood's emotions were high when a fire in one home caused damage to the home right next to it. Thankfully, no one was harmed. However, many belongings were a complete loss in the fire, and a lot of cleanup was performed by our Cloverdale fire damage crew. What's essential if you have a fire damage experience? The absolute first thing to remember when fire damage happens is to contact your insurance company. Remember to not walk through the home or start cleanup yourself; doing these things could cause disturbance that would ruin your home or belongings even more, or the structure could be very unstable which puts you in direct danger. Contact your local Cloverdale fire damage technicians at 537-6635 for more information and assistance on fire damage cleanup services! There are a lot of homes and businesses in Sonoma County, especially in the downtown Santa Rosa area. We are available to assist in any Santa Rosa fire damagesituation. Homes and businesses that are close together are more likely to suffer more damage because fires can jump. We always encourage everyone to get homeowners insurance in case you have a house fire. Otherwise, would you be able to replace EVERYTHING in your home? Our policy of cleaning and restoring your items involves the most inexpensive and beneficial route possible. SERVPRO's goal is to restore as many of your items as possible before replacing. Otherwise, the insurance company will have to pay more, they may recommend you shop around for another restoration company, and that company could possibly cost you more if they aren't as thorough or complete as the staff at SERVPRO of Sonoma County NE. Make the right choice the first time! Choose the company that has put in the time in construction, management, IICRC Certifications, and earning awards from Corporate for being one of the highest ranking Franchises in Professionalism and Management. SERVPRO is a Franchise system with over 1,700 independently owned and operated locations nationwide, as well as in Canada. We are able to assist with smoke, fire, and water damage. We are available 24 hours a day, 7 days a week, and our technicians are all trained to handle any type of disaster. You and your adjuster will have the final say to the extent you want cleaned. We will always communicate with your insurance company about any Healdsburg smoke damage cleanup before starting it. We use different and state-of-the-art techniques to restore your home. We are able to restore windows, metals, floors, clothing, duct work, and crawl spaces. We are also able to prep for paint work, deodorize, and finish floors. Healdsburg smoke damage has nothing on us! Items such as heirlooms, jewelry, and other sentimental items will be treated with the best care. We understand the importance of these memories. 4.) Your home will ALWAYS be in the best of care with our technicians and project manager. Maintaining health and safety of all people involved, as well as animals, is essential. 5.) We can't authorize whether any items that are damaged beyond repair can be replaced. Our duty is to preserve and protect your home as much as possible after damage. We believe in restoration before replacement, always. We are sure you're going through a lot, and we are here to help restore your home as much as possible. Give us a call at 537-6635 for more information, or if you need smoke damage cleanup in Healdsburg. Cloverdale home repair is no news to us! We are used to dealing with fire and water damage, so what may take months for a repairman or homeowners to tackle will take us just a few weeks, depending on the size of the loss. Besides, doing the work yourself may end up costing you more money. Believe it or not, we have gotten a lot of calls about water damage in Cloverdale, Healdsburg, and the surrounding areas. Leaky roofs and broken pipes are the first thing you notice because you feel those huge drops on your head, or you come home and the ceiling is on your floor. Even just watching the ceiling fall as you're on the phone with the insurance company is enough to give you a stroke. Wildfires kept us busy this last year, as well as this year and not to mention frozen pipes. We try to remind everyone about fire safety and getting pipes insulated, as well as checking smoke alarms so they work year round. But, sometimes these things get forgotten with everything else going on in our lives. Since you already have enough to deal with, leave it to us. All you have to do is pick up the phone and call SERVPRO of Sonoma County NE! Black Mold Removal: The Beginning of the End! Depending on the size of a mold contaminated room; you might be able to clean up the mold yourself. There are several important steps that need to be followed; otherwise, you risk a bigger and more frustrating mold mess. What is the source of the mold? Knowing the source of the black mold problem is essential so it doesn’t continually grow back. Otherwise, all the work will be wasted. We performed this Cloverdale black mold removal after a washing machine flood. Needless to say, the homeowners appreciated our thorough investigation, which started with the source. Making sure the washer wouldn’t leak again was also essential. Prevent mold spores from spreading! This tip is all too important to skip. Mold spores can be airborne, especially once they’re dried. They will mix with dirt, dust, and oxygen. Sealing off a room from the rest of the house will prevent further contamination. If mold has dried, keeping it damp will prevent the mold from spreading. This method may seem contradictory, but water will weigh down the spores until they can be removed. Otherwise, dry spores will become airborne, which can affect your health and breathing. 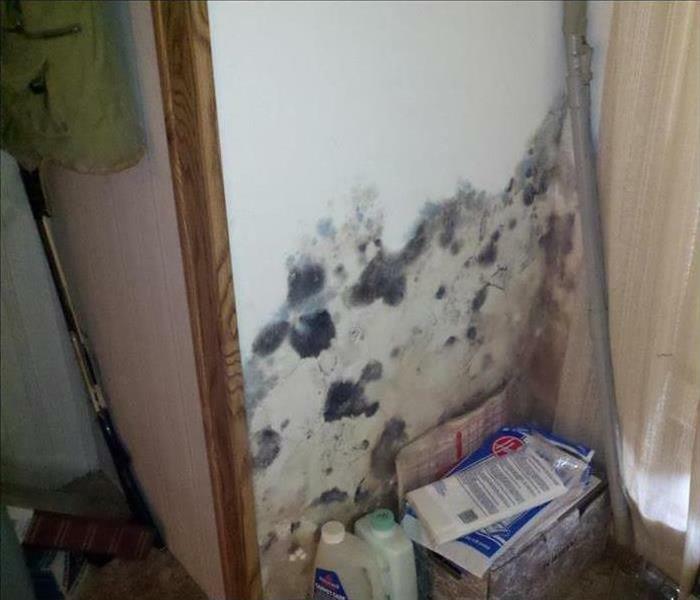 If you don’t get every little spot of mold removed, the mold may multiply and all your work will be worthless. Calling professionals, such as SERVPRO of Sonoma County NE, will take the headache out of black mold, and black mold off your mind. There is no reason why you should have to deal with a mold mess yourself. We can work with you, and potentially your insurance company, and take care of any issues. Sonoma County was hit with a lot of flooding last couple years, predominantly in the Windsor and Healdsburg areas. Are you prepared? Having clean rain gutters, repairing holes in roofs, and insulation of pipes will all prevent heavy water damage. During the colder seasons, pipes tend to freeze and break much more often. Even a small trickle of water in the upstairs bathroom can prevent water from freezing. While replacing old pipes may be a pain, the bigger pain would be replacing all the furniture, dry wall, and flooring due to water or flooding damage. If you experience Geyserville flood damage this winter, be sure to give SERVPRO of Sonoma County NE a call. We are prepared for the season, and available 24/7! SERVPRO employees have no problem working in the rain! We've had countless interactions with different weather conditions-blistering heat, freezing cold, dead of night (well, that's not a weather condition, but you get the idea)-and we've powered through because of the importance for the customer. Each day that we don't work on a water damaged home could be tens or hundreds of dollar spent that isn't NECESSARY. Although we have been doing continuous active work in Sonoma County, we have previously come across dozens of storm jobs. We have worn special suits to crawl under houses during the rainy season. Even with severe water damage and leaks, we aren't afraid to get dirty. When it's absolutely necessary, we want to do everything possible.